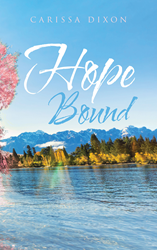 Recent release “Hope Bound” from Page Publishing author Carissa Dixon is an appealing book on a woman’s decision to leave her village after encountering a girl who still hopes for better days, joining her journey to find something better despite the challenges humans face in a changed world. Carissa Dixon, a strong, independent dreamer and thinker, has completed her new book “Hope Bound”: an absorbing story about Shay, a mere survivor during difficult and hopeless times until she has ran into a spirited girl full of hope in life and has been led to make a life-changing decision that could make an impact to the course of her life. Published by New York City-based Page Publishing, Carissa Dixon’s remarkable book is focused on having an enduring hope in spite of being constantly challenged to survive in life. Moreover, it shows that encountering a person who still has a craving for life can also encourage one to set forth on a hope-filled journey to greater things. Readers who wish to experience this exciting work can purchase “Hope Bound” at bookstores everywhere, or online at the Apple iTunes store, Amazon, Google Play, Kobo or Barnes and Noble.